Yet, as enticing as all of this sounds, more and more evidence is emerging to show us that dieting actually leads to weight gain (not to mention complete alienation from your body)! See this wonderful video about the reality of diets from Evelyn Tribole, my mentor and one of the authors of Intuitive Eating. Focusing on the breath teaches us to synchronize the body and the mind: When we sit to practice meditation, we place our attention on the breath, which is always coming in and going out in the present moment. In this way, our bodies and minds are in the same place (a relatively rare occurrence for many of us!). Much the same way, our “eating bodies” exist in the present moment – we are a certain degree of hungry or full and we have specific tastes and cravings, all of which change moment to moment. 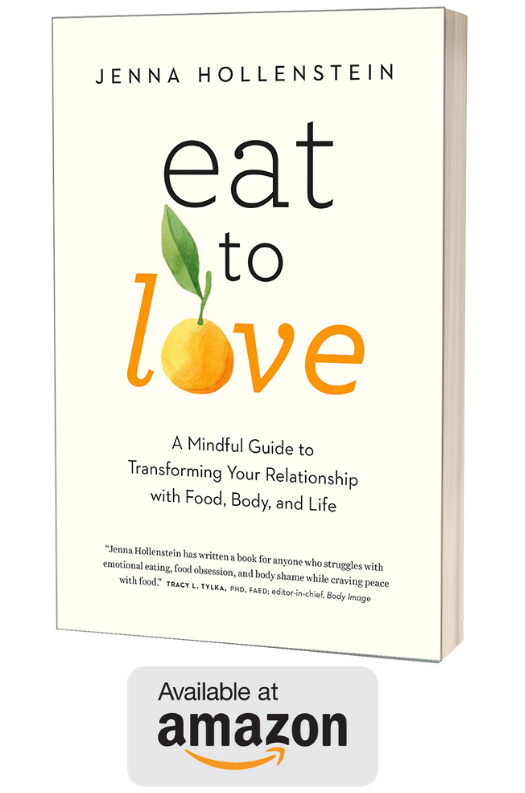 By fostering the connection with the body, we can begin to notice and respond to internal cues that tell us what, when, and how much to eat instead of the external cues (like diets). Sitting with ourselves helps us develop non-judgmental curiosity: As we practice just being with ourselves in meditation – as opposed to always doing, running, and accomplishing – a lot of things come up. When they do, we can choose to run away or to become curious. And because the meditation technique is so gentle and accommodating, becoming curious might seem a little less threatening than it did before we practiced. Choosing not to run (or to eat to change the way we feel) is how we start to develop great bravery, and bravery is definitely required when we are contemplating doing something different than seemingly everyone else in the world. Holding our seat despite what arises teaches us to tolerate discomfort: Perhaps the greatest thing meditation can teach us about how to eat is how to tolerate discomfort. Painful emotions like sadness, anxiety, loneliness, and anger often lead us to the pantry or fridge when we’re not hungry. Turning fully toward these difficult feelings takes an enormous amount of courage but can actually be a lot less scary than pushing them down with food or other substances. Learning to tolerate discomfort also lessens our isolation, makes us more compassionate, and contributes to a greater sense of confidence.